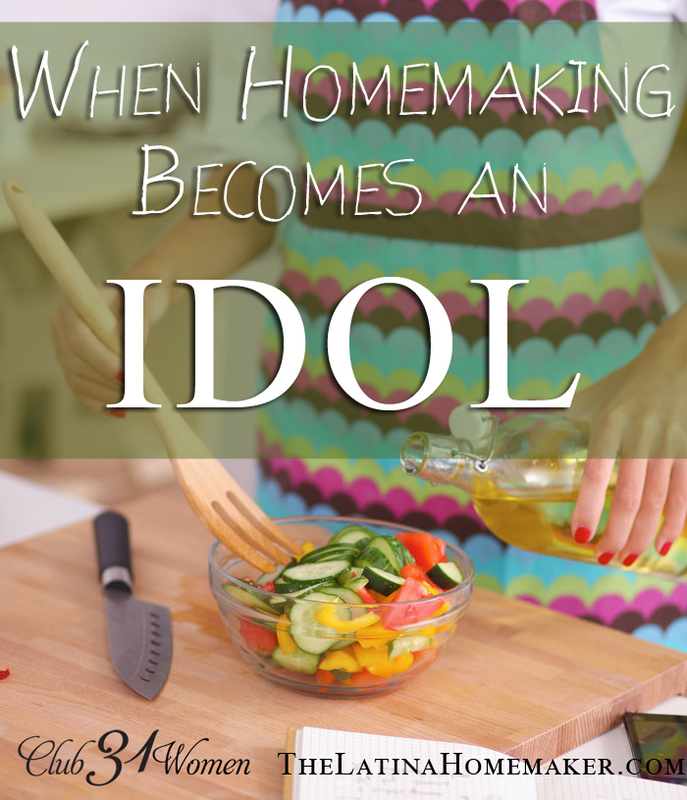 Today I’m over at Club 31 Women discussing the topic When Homemaking Becomes An Idol. It might seem ironic that I share homemaking tips and solutions on this blog, but then discuss this topic. But I felt the need to share this because it’s easy to get consumed in our homemaking duties that we neglect other areas of our lives. Everything in life needs balance, and that includes our homemaking. If this is something you’re currently struggling with, I hope that this post encourages you. When my husband and I got married, I was a terrible homemaker. I couldn’t cook, my cleaning skills were limited, and ruining clothes while doing laundry became the norm. But as time passed, it became easier and I started to enjoy keeping the home. In fact, I took my homemaker role so seriously that I wanted everything to be perfect. I quickly became consumed with my homemaking tasks, to the point that I had very little time for God or my family. From the moment I woke up, I wanted to tackle a new house project or cross a task off my to-do list. Weekends were no longer set aside to enjoy with the family and recharge. I spent Saturdays cleaning from dusk ’til dawn. Sundays were better, but I certainly wasn’t honoring the Sabbath. My home, and my role as a keeper of the home, had become an idol. Join me at Club 31 Women to continue reading. This became a problem with me after I starting staying at home. With Pinterest, I began to add some sort of recipe everyday. I’ve obsessed with cooking and my daughter’s extracurricular activities. Since I started tot school with her, I didn’t want her to feel like she’d missed out on anything so she had somewhere to go everyday lol. I’m thankful for conviction.